A Man and His Music is a 1965 double album by Frank Sinatra. It provides a brief retrospective of Sinatra's musical career. The album won the 1967 Grammy Award for Album of the Year. Instead of using the original recordings, which were made for RCA, Columbia and Capitol Records, and therefore not licensed for use by his then-current label, Reprise, Sinatra used re-recorded versions for the majority of the album's songs, culling tracks from his prior Reprise albums. Three songs were specifically recorded for the project: "I'll Never Smile Again", "Come Fly with Me" and "Love and Marriage". 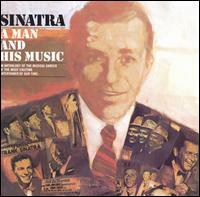 There is also a narration from Sinatra that runs throughout the album. Approximately 2,000 copies of this album were originally released in a special wooden slipcase containing 3D artwork on the cover in the form of a metal plaque. Each copy was numbered and contained a card signed by Sinatra himself. The packaging also included a booklet highlighting Sinatra's career. A majority of these special "Man and His Music" LP's were given away as door prizes by Sinatra at a party in Palm Springs. The party celebrated the singer's 50th birthday, as well as the airing of Sinatra's 1965 NBC television special of the same name (Frank Sinatra: A Man and His Music). This page was last edited on 6 November 2018, at 16:12 (UTC).